Dr. Neil deGrasse Tyson often hosts the popular PBS series NOVA. 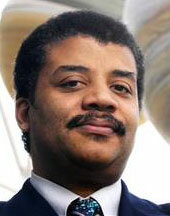 Tyson is an astrophysicist, astronomer, lecturer and noted science television celebrity. Noted science popularizer Carl Sagan tried to recruit him to undergrad studies at Cornell University, but Tyson instead went to Harvard, where he earned his BA in Physics, and then to Columbia for his doctorate in Astrophysics. His profile lists interests in star formation, exploding stars, dwarf galaxies and our Milky Way. He uses some of the world’s largest telescopes in his research. He has served on government steering committees for future NASA space exploration, is the author of several books, and holds nine honorary doctorates. Like frequent NOVA co-host Alex Filippenko, Tyson has an extraordinary ability to explain the most abstruse theoretical concepts of physics to the lay person while presenting solid factual and theoretical foundations. His enthusiasm is also contagious and instantly engages the listener. This entry was posted in Profiles and tagged Commentary, History by Alex. Bookmark the permalink.